Standard targeting condition options are described below in the order that they appear within the option menu of the Popup Editor at 'All Popups' -> 'Popup Settings' -> 'Targeting'. Categories, tags, and format are typically associated only with posts. 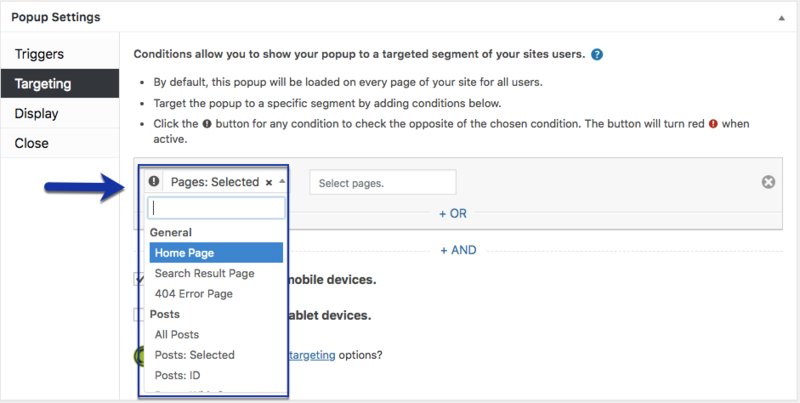 Plugin users who wish to target conditions other than content should use the Advanced Targeting Conditions plugin extension to Popup Maker. For guidance on how to set up targeting conditions in the Popup Editor, view the related article below. This will load the popup on the Home Page only. This loads the popup on your Search Pages. This Condition loads the popup on only your 404 Page ( 'page not found' page ). This loads the popup on all of your Posts. This loads the popup on the selected Post. Select a Post by typing the Post Title and clicking the options that drop down. This Condition does the same thing as Posts: Selected, but allows you to filter via the Post ID number. This will load the popup on only Posts that are contained within the selected Category. Select your Post Category by typing and then selecting from the drop down. This will load the popup on Posts that have the selected Tag. Select your Tag by typing and then selecting from the drop down. This loads the popup on the Posts with the selected Format. Select a Format by typing and clicking the options that drop down. This will only load the popup on your Blog Index page. This will load the popup on all Pages. This loads the popup on the selected Page. Select a Page by typing the Page Title and clicking the options that drop down. This Condition does the same thing as Pages: Selected, but allows you to filter via the Page ID number. This Condition will allow the popup to only be loaded on pages that are a Child Of the page that you select for this Condition. This Condition will allow the popup to only be loaded on pages that are a Ancestor Of the page that you select for this Condition. This Condition will load the popup on all Media Attachment Pages. This Condition will load the popup on Selected Media Attachment Pages. Select by typing and clicking your option. This Condition will load the popup on Selected Media IDs. Select by typing and clicking your item. This Condition will load the popup on all of your Posts that fall under any and all of your Categories, even Uncategorized. This Condition will load the popup on all of your Posts that fall under your Selected Categories. Select a Category(s) by typing and clicking options that drop down. This does the same as Categories: Selected, but uses Category ID(s) instead. This Condition will load the popup on all of your Posts that fall under any and all of your Tags. If a Post has no Tag, the popup will not be loaded. This Condition will load the popup on all of your Posts that fall under any Selected Tags. Select a Tag(s) by typing and clicking an option in the drop down. This Condition does the same as Tags: Selected, but uses ID(s) instead. This Condition will load the popup on any and all Posts that use a Format. This Condition loads a popup on any Posts that use the Selected Format. Select a Format by typing and clicking your choice in the drop down. This Condition does the same thing as Format: Selected, but uses Format ID(s) instead.